After Microsoft announced that it will shutter its Modern app version of Skype, forcing Windows users to use the desktop version instead, it promises that a universal app of the messaging platform will be ready soon for Windows 10. "Later this year we'll deliver a set of lightweight UWP apps for messaging, calling and video that cater to users who want simplicity and efficiency," a Skype spokesperson clarified with TechRadar. "They'll be built into Windows 10 which means you'll get the same experience on phones, tablets and PCs. For users who want the rich, familiar Skype experience, the full Skype app will also come with Windows 10. Our users can choose the right experience for them." 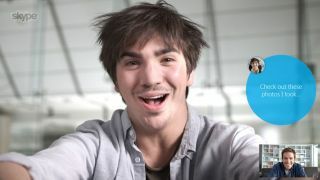 Essentially, this means that the situation for Skype will basically be the same as it today – PC users can choose between a universal Skype experience, which should be similar to the Modern or Metro UI version of the app available through the Windows Store, or they can use the desktop version of the app that contains more functionality. For an app based on communication, the announcement yesterday that the Modern version of Skype will be discontinued on July 1 sent a mixed message to users. At the time, Microsoft made no mention that a universal app – Microsoft refers to this as UWP, or universal Windows platform, app – is incoming, creating speculation that Microsoft is backtracking on its push for universal apps. Fortunately, as we found out today, this is not the case. It's unclear if the universal Skype app will arrive in time for Windows 10's launch this summer. In addition to the Skype apps, Microsoft is also testing Skype for the browser. Launching in beta, the Skype for Web experience doesn't require any downloads and runs inside the browser. With Windows 10, Microsoft is not only leveraging the Windows branding across different platforms – PC, tablets, phones, Internet of Things (IoT), Xbox and more – but it will also bring these platforms together. Instead of asking third-party developers to create separate apps for different platforms, universal apps would run across all platforms with minor changes to code. Hopefully, this minimal effort will help Microsoft attract developers to building out a robust software ecosystem for Windows 10 devices. Rivals Google and Apple each have roughly 1.5 million apps for their Play Store and iOS App Store, respectively. Microsoft recently announced that Windows 10 will arrive on July 29. There will two versions offered to home PC users – Windows 10 Home and Windows 10 Pro. The OS will be a free upgrade for users migrating from Windows 7, Windows 8 or Windows 8.1. With Windows 10, Microsoft will introduce new features to users, including Cortana, Microsoft Edge and Continuum.